Milton's Louisiana vacation is off with a bang in a big way! Our doodle certainly has a penchant for eyeglasses. Milt also ate a plate of sausage off his grandparents' kitchen table. No one saw him do it, but suspicions are high. Thank goodness we have family taking care of our boy. Forgive and forget. Merry Christmas Eve, everyone! 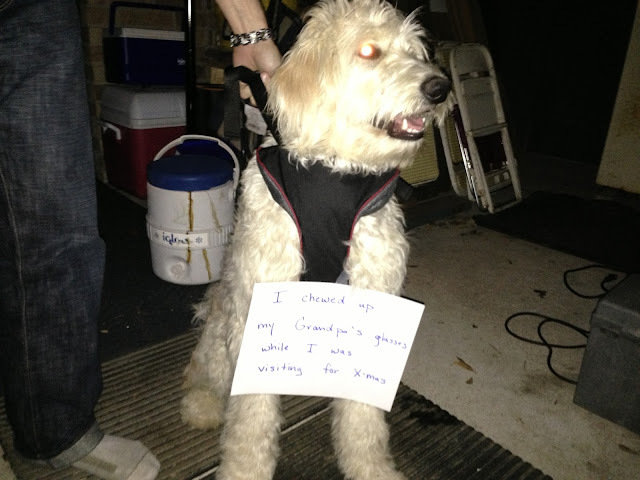 Dog Shaming will never be the same once Stan and Milt make the big times.